→Best Cordless Chainsaw – Battery Power Enough For 2018 ? Best Cordless Chainsaw – Battery Power Enough For 2018 ? In this article we’re going to look exclusively at battery-powered chainsaws. There’s a wide range of models and power levels available on the market. Looking at several of the best of them at once should help you get an idea of the comparisons possible between them. Of course, it all depends on what you want your saw to do; how long is it going to take you to get the job done, how often do you need to use a chainsaw, and what does your budget dictate for your purchase? These considerations are all important, so we’ve tried to give you some helpful information to sort through all the factors that go into finding the best battery powered chainsaw..
What do you get with this cordless chainsaw? What comes with the Makita Cordless Chainsaw? No battery-powered saw will do everything a gas saw will do. But the battery-powered saws have advantages over gas saws that a lot of people truly appreciate. And with none of the downsides of the gas saws that most people don’t appreciate! Battery-powered saws are especially helpful for those who don’t need a chainsaw very often, who don’t have to cut wood all the time for firewood or a business, who need something lighter weight and quieter to use, or who are concerned about the environmental impact of gas engines. Another reason to have a good battery-powered saw is for limbing trees once they have been felled. Using a lighter-weight saw for that job can minimize bouncing and kickbacks from springy limbs. So here it is. Our take on the best of the cordless chainsaws available. Best of luck to you as you make your decision! Scotts is a lawn care company we usually associate with grass seed and fertilizer because, of course, they’ve been around for over a hundred years and started out selling grass seed. They recently acquired Miracle-Gro, too, so they are all about lawns. And they now have their own line of electric battery-powered lawn care tools, which makes sense, since they probably know more about lawn care than any other company around. But it’s probably not the first name you think of when shopping for a chainsaw. In 2014 Scotts introduced its SYNC System line of cordless lawn care tools, all 20V and all with interchangeable batteries. We’ll focus on the 10 inch chainsaw, of course, which is a great lightweight tool for smaller cutting and clean up jobs. The saw features a 10” bar and chain and a 20V Lithium-Ion battery with a power fuel gauge conveniently located on the saw. It has a unique and innovative charging system, a push-button oiler, and it’s made in China. It’s also covered by a 3-year warranty, which is a little better than the average industry standard of 2 years. It measures 24 x 9.5 x 10 inches and weighs just 6.5 pounds, including the battery. Opening the box you will find the saw, chain and bar, scabbard, the 20V Lithium-Ion battery and charger, charging station, and owner’s manual. One of the greatest features of this saw is the charging system. Of course Scotts, not known for power tools, came up with a truly unique design for this component. The charger can be mounted on the wall and used as a hanger for the tool while charging the battery at the same time. No need to remove the battery. It’s a ‘smart charger,’ too, and shuts off when the battery is fully charged, which should take no more than 45 minutes. So you can either take the battery out and just use the charger for the battery, or you can use it as a battery charger and simultaneous tool hanger. Very clever! Another great feature is the on-board fuel gauge for the battery, so you can tell at a glance how much battery you have left. That’s one thing about lithium batteries. When they’re done, they stop. No warning. Just done. So if you have a way to tell how much power you have left, it might make your day a little easier, because now you know a bit better how to plan. Of course, if you have another SYNC tool, you can just switch out the battery and keep going. Beyond that, the chainsaw is small and lightweight. It’s easy to handle and comes with excellent directions in the owner’s manual, including lots of tips on good cutting practices. One user noted it would cut through a 7” pine log, with some patience. Granted, small battery-operated chainsaws will not have the power and speed of larger saws, and certainly not of a gas chainsaw. That’s a given. It’s all about what you need to do and finding the right tool for the job. It’s a great size for taking care of smaller trees, and would be perfect for taking along on a camping trip to make firewood. The push-button oiler is a negative for some users. It does take some thought to remember to use it every 30 seconds or so, especially if you’re used to an automatic oiler. One person commented that it was distracting, and the saw does go through the oil fairly quickly. It also doesn’t come with oil, so that’s something you’ll have to make sure you have on hand before you use it. Another negative is the lack of a chain brake. A chain brake isn’t nearly the safety concern on an electric chainsaw that it is on the gas-powered models. Battery powered chainsaws stop almost instantaneously; when the trigger is released, the power is cut. All the same, some electric chainsaws do have them, and this one doesn’t. The Scotts SYNC 20V also does not have tool-free chain tightening. This is a nice feature on some electric chainsaws, but this model uses a hex key, which is included with the saw. Some people thought the chain wasn’t very sharp, and one person said they had to sharpen the chain right out of the box, but isolated incidents like that will happen. Sometimes things just aren’t done quite right. You’ll have that. A few users mentioned the lightweight plastic used on the saw body. That might be a place where there’s room for improvement in future models. Words like ‘flimsy’ were used. Ouch. But that lightweight plastic could well be part of the reason it’s easy to use and maneuver without fatigue, too. The bottom line is that a lot of people just love this little saw. It has a lot of nice features, and if you purchase some of the other battery-operated tools in the SYNC line, you can have a lot of your lawn and yard care needs covered by quiet, clean, reliable electric tools with interchangeable batteries that charge quickly and tell you when they’re getting low. You can be organized, too, if you mount all the chargers on the wall and hang all the tools on the chargers. Some folks will think that’s pretty slick. One user was so enthusiastic about this battery chainsaw, he commented he thought it would probably work on Zombies, too. Ok, maybe not. But who knows? The Black + Decker LCS1240 is a handy, small, battery-powered chainsaw. It has a 12-inch bar and chain, so you know it’s made for small jobs. It weighs just over 10 pounds, and the lithium ion battery holds a charge longer than some other batteries. It has a low kickback Oregon bar and chain, comes with an automatic oiler and tool-free adjustment for chain tension. Run time on the battery averages 45 minutes, although that does depend on what you’re cutting. Some users reported much less time, and others reported longer run times. Black + Decker claims it will hold a charge 18 months in storage. This chainsaw comes with Oregon bar and chain, battery, charger, chain guard, and manual. One of the best features of the LCS1240 is that it’s Interchangeable with all the other 40V Max System battery-operated B+D tools. If you already own some of the other tools, you can just buy the saw without having to shell out the money for another battery and charger. B+D has a lot of fans of this line of tools, and most reviewers love this little saw. It’s lightweight, which is important because fatigue is associated with accidents; it’s easy to use, quiet, and clean, great for cleaning up downed limbs and smaller trimming jobs. It doesn’t run as fast as a gas saw, but for what it does do, users are happy to have a little more patience. Two negative comments came up often in reviews. The first is that it uses more oil than some other models. Although it does go through oil faster, the comment was also made that oil is cheap, and it’s worth not having to deal with all the negatives of a gas saw, especially when all you need to do is a smaller job. Another concern is that charging time is longer -- approximately 5 hours. Here’s where another 40V Max battery would come in handy, but a lot of users stated that they were content to get their smaller jobs done and let the battery charge. One reviewer said it seems underpowered for what it does, and he mentioned the battery popped out of place, making him wonder about the quality of the clip used to hold it. It has plastic bucking spikes, which is probably logical, considering it’s small size. You’re most likely not going to be doing a lot of bucking of large trees with it. It appears that most users are happy with the Black + Decker LCS1240 because they have already invested in other B+D 40V Max System tools and have had a good experience with those. They also know what this little saw is going to be able to do for them. Few if any reviews were negative for reasons of not being able to do a day’s worth of logging or cutting down large trees. Realistic expectations are key, and if you need a small reliable saw to get the less involved jobs done around the yard or small acreage, this is one of the most popular choices. Black + Decker has been around for over 100 years, and is now owned by DeWalt, another highly-regarded name in power tools. If you are looking for a small, efficient, and reliable battery-powered saw, this is definitely one to consider. 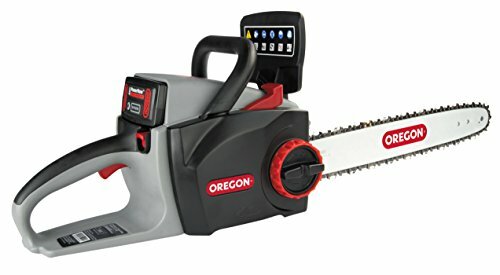 Oregon is one of the best-known names in chainsaws. They are the very best at producing chains for almost any chainsaw on the market, if not all of them. They have earned the reputation of being the best at what they do and making products that get the job done. This particular model is in a bit of a different class than the other two reviewed so far. Instead of a 20V battery, this one has a 40V MAX Lithium battery. It’s an upgrade from their previous model, the CS300-E6. The 40V battery has a new premium cell technology. It has a brushless motor and a 16” bar. Chain speed is very impressive 2796 FPS. It also has the very popular PowerSharp System for sharpening the chain on the job. No stopping and removing, sharpening, and replacing the chain. Now this chore can be crossed off the list in as little as 3 seconds. Other valuable features include the automatic oiler and tool-free chain tension system. Battery endurance for 2-3” diameter branches is about 400 branches on a single charge. The battery charges in something around 3 ½ hours. Total weight with the battery is 12 pounds. Dimensions are 12.13 x 11.13 x 16 inches. Oregon has manufacturing plants in the USA, Canada, Brazil, and China. This model is made in China and includes a 3 year warranty on the saw, 2 years on the battery. In the box there is the saw, the bar, and the chain; the battery and the charger. There is some assembly required; typically it’s just a matter of attaching the bar and chain. One would expect to find an owner’s manual, but if it’s not in the box, it’s downloadable from the Oregon website. One of the users’ favorite features is the PowerSharp System. So far no complaints about the condition of the chain after sharpening, which we saw with some other saws. It’s the only self-sharpening and battery operated chainsaw available. The brushless motor provides higher torque and more power; this is high performance. 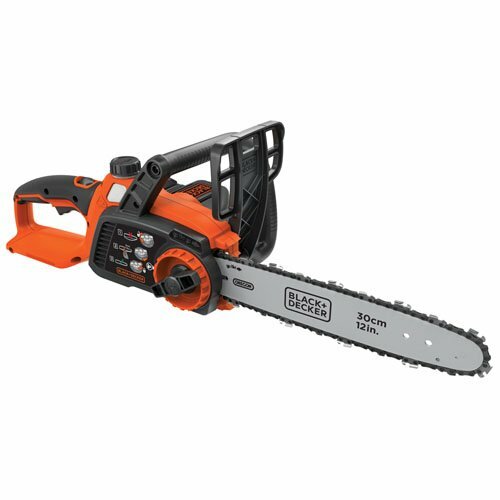 It’s four times quieter than the typical gas-powered saw and 40% faster than the Oregon CS250, which is highly rated. One great feature is that it holds a charge for months in storage, so even if you haven’t used it in a long time, you should be able to just pick it up and go. And of course, the battery is interchangeable with all other Oregon battery-operated power tools. Another great feature is the tool-less tension system and a chain brake, which is never a bad idea. For a 16” saw, it weighs in at a light 12 pounds. And Oregon even sells a bag to carry it in. Yes, you buy it separately, but lots of people are going to like that option! Oregon customer service gets lots of positive comments. They do their best to provide as high quality support as they do the products themselves. Negative comments are rare, and from what we could tell, they came from those who did not really know what to expect from a battery-operated chainsaw versus a gas one. You are not going to find many, if any, electric chainsaws that have the same speed and power of a gas model. They are fundamentally different, and that’s ok, as long as you know what you’re getting. Other negative comments may have originated from user error, but in any case, Oregon reps were aware and responded in a timely manner. The one true downside we can see is the length of time it takes to charge the battery. 3 ½ hours is a long time, so it’s a good idea to have another battery charged up. Either just purchase one or buy another Oregon battery-operated tool. It always pays to have an extra battery, so you don’t get stopped in the middle of a job. The lithium battery gives no warning as it nears the end of the charge, so you don’t have any chance to find a good place to stop and charge the battery. With a 16” bar and the 40V battery, this isn’t just a light trimming and cleanup saw. This will do some more extensive work, felling and bucking up smaller trees. It’s more of a workhorse than some of the smaller saws we’ve looked at. It’s all in what you need to do and knowing what tool you need for the job. If you’ve got more to do than just a little trimming and pruning, this may be the tool for you. DeWalt tools have been around a long time. Raymond DeWalt, the inventor of the radial arm saw, started the company in 1924. Since 1960 DeWalt has been owned by Black and Decker, but the DeWalt reputation for quality has remained constant. The DCCS690M1 is the only model of cordless chain saw they sell, and online reviewers give it pretty high marks. Here are the key features offered. First off, the brushless motor. The major benefit here is that there are no brushes to replace. Ever. The 40V lithium 4AH battery gives you more power and lasts longer. Low kick-back Oregon bar and chain, with chain brake. Auto oiling and tool-less tension adjustment are very convenient, and maybe best of all, the variable speed trigger. When you open the box, you will find the DCCS5690 Chainsaw, the 40V MAX Litihium Ion battery with charger, the 16” Oregon bar and chain, and a sheath. One of the best features of this cordless chainsaw is the brushless motor. That means no brushes to wear out and replace. It also has an auto-oiling system and tool-free tensioning for the chain and bar tightening. It weighs in at just over 18 pounds and measures 9.4 x 36 x 9.3. Another plus is the battery charging time. From dead to full, it’s only about an hour. It also comes with a chain brake for safety, and another unique feature is the ¼ turn cap, allowing for faster oil filling. But perhaps the best-loved (and very rare) feature is the variable speed trigger. No need to run the motor full open when just cleaning up limbs after dropping a tree. And the battery will last long enough to drop a good sized tree. One Youtube reviewer dropped and cleaned up a 40-foot tree that was 14 inches in diameter. That’s a huge plus when you can take care of an entire tree without stopping to charge or replace a battery. That could be as much as 2-3 hours out of one battery charge. Pretty impressive! The battery is also interchangeable with other DeWalt 40V power tools such as the string trimmer and leaf blower. Another design feature that is worth noting is the fact that this saw does not leak oil. Leaking oil is pretty much a given for all chain saws, whether battery-operated, corded, or gas. It’s just what they do. But not this DeWalt. Kudos to the engineers that figured that out! It’s also easy to see the oil level with the oil level indicator. A handy feature is the hook on the back of the saw, for hanging in the workshop or garage. It also has a safety switch, which must be off in order for the saw to run. That’s another unique feature and a safety plus. The chain brake works very well, and can sometimes be a problem if you have a tendency to bump it accidentally, but for most reviewers that wasn’t a significant issue. Another design plus is the ample venting around the battery and motor, to prevent either of them from overheating. Lastly, DeWalt guarantees that the performance of this electric cordless chainsaw model is comparable to that of a gas-powered saw. That’s a really bold claim, but reviewers do seem to bear it out. The saw comes with a 90-day money back guarantee. If you don’t like it, they will take it back. There’s also free service for a year, and a 3-year limited warranty. One negative that came up was the handle not being positioned to make it easy to hang on a belt when climbing; another was the safety switch being positioned for a right-handed operator. Lefties have to maneuver into a slightly awkward thumb position in order to get at the switch, but overall, that’s a minor point. A couple of reviewers did mention having trouble with the bar oil leaking and the chain falling off. Both of these issues were addressed as likely missing components. Other purchasers who had the same problems had resolved them by obtaining missing parts. Another negative comment was about the plastic bucking spikes. However, another purchaser pointed out that for the power of the saw, the smaller spikes are appropriate. He claimed a more robust bucking spike could stall out the motor. So overall, it was hard to find any seriously negative remarks about this saw. All in all, the DeWalt DCCS690M1 could be one of the best values on the market for cordless chainsaws. There is another version of the same saw with a 60V battery, which gives it the extra power and battery life. 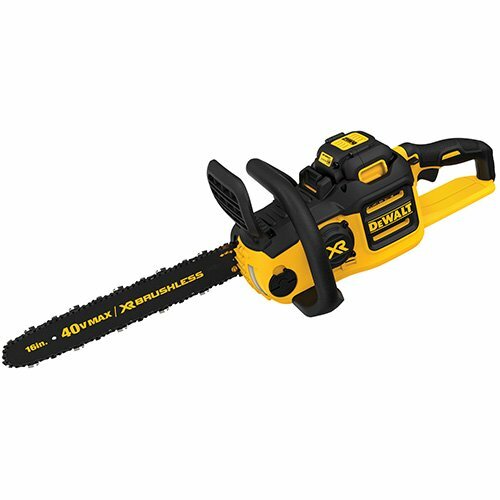 There’s also the option to buy the saw without a battery, in case you already own another DeWalt 40V Max Lithium tool and don’t want to buy a second battery. If you really want or need a heavy-duty chainsaw and maybe with all the power and stamina of a gas-powered saw, the quality of DeWalt, and the benefits of battery-operated, then this may very well be just what you’re looking for. The Makita HCU02C1 LXT is a very popular choice for a cordless chainsaw. It’s the complete opposite of the Black + Decker LCS120 20V. 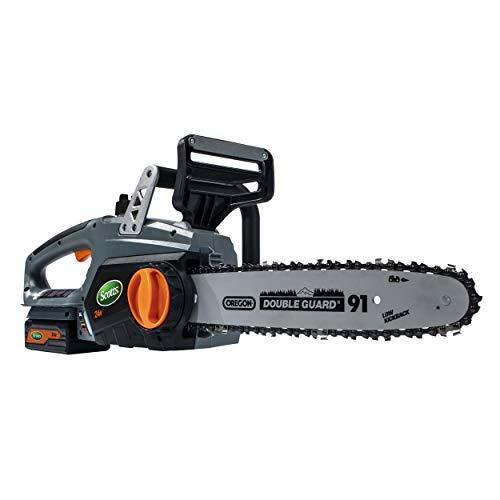 This is a true workhorse chainsaw, and users rave about it. They almost unanimously sing its praises. It boasts 36 volts, which is a great feature and almost as powerful as they get. Chain speed is an impressive 1650 FPM, the bar length is 12 inches, and yet it weighs only 10 lbs. The motor isn’t brushless, but the brushes are replaceable. Noise level is only 89 decibels, which is about 40% quieter than a typical gas-powered saw. The automatic chain oiler is adjustable, and the oil fill level can be easily monitored through the view window. There is a chain brake, cushioned rubber top handle, and tool-free chain adjusting system. The HCU02C1 is made in China and is covered by Makita’s generous 3-year warranty. Makita has all the bases covered here. This saw is truly impressive. In the box you will find the 36V Lithium Ion battery and 36 volt charger, the 12 inch guide bar and the chain saw. Some reviewers loved the fact that there is an adapter available that allows the use of two 18V batteries, instead of one 36V. One line of Makita’s battery-powered tools use the 18V battery, so those who already own one or more of those tools appreciate the convenience of using the 18V batteries they already have. That adapter may not be as readily available as it used to be, but it can be found. In any case, there were a number of reports of being able to do all the work needed for a day with the 36V battery on one charge. The most-loved feature of this saw is its power. If the Black + Decker LCS120 is a toy, this Makita HCU02C1 is a tool, in the best sense of the word. It’s well-balanced, has great run time, power, and torque, but with all the convenience of battery-power versus gas. Reports of felling 30 foot trees and 8 inch trunks come from satisfied users. With a 12 inch bar, you won’t be taking down any ancient oak trees, but you can sure make short work of storm damage and keeping the yard or farmette looking good, cleaning up brush, and limbing larger trees. A great suggestion from some reviewers is to buy a plastic tool case to put the saw, (with bar detached, if necessary) battery, charger, and all the necessary accessories in. Most chainsaws do not come with a case, and we’ve often seen that brought up in reviews and questions asked about certain models. This seems to be an ideal solution to this problem, though. If one can find a good plastic toolbox at some online site or big box store that has room enough to store all the necessary items, a lot of storage and portability questions could be addressed in a very practical and inexpensive way. One downside mentioned by reviewers is the possibility of the battery running down quickly. This of course, depends on what you are cutting and how big a job it is. But with any battery-operated tool, the common limitation will be the battery. Having extras or being willing to take into account charging time will keep expectations realistic. Most reviewers were very happy with the battery life. The other factor that could be considered a downside is the price. 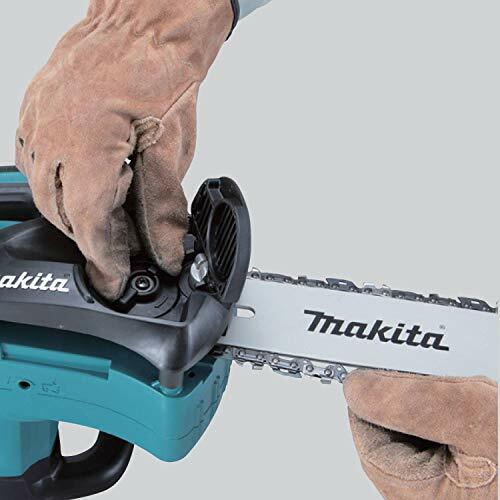 The Makita does cost more than most other battery-powered chainsaws, but Makita in general is a higher-end product, and the battery alone will run about $200. Makita has been around over 100 years now, and they have built a reputation for innovation and the highest quality. The higher price is an overall indicator that you get what you pay for. In this case, the quality and power are unquestioned, so the real limitation is the depth of your pocket. This powerful battery-operated chain saw is Amazon’s #1 bestseller in Power Chainsaws, and apparently with good reason. When compared to other electric chainsaws, battery power has an edge, of course. But the Greenworks also has a number of high-value features. The brushless motor is said to offer 30% more torque and 70% less vibration. It also comes with a chain brake, Oregon bar and low kickback chain. (The chain brake will stop the chain within about 1 second.) It has an automatic oiler, hand adjustment knob for chain tension, and metal bucking spikes. One thing to keep in mind is that the chain tension should be just enough to take out any slack. Tightening it down too hard can cause the bar to warp. Even when new, though, the chain tension adjustment seems to hold well, which is unusual. GreenWorks claims it will cut up to 100 cuts on a single battery charge, and depending on what you’re cutting, that may be true. Many purchasers seemed to back up this claim, while others made good use of a second battery to switch to while they charged the first. The battery is a 40V 4AH lithium, and it’s interchangeable with many of the batteries that come with other GreenWorks lawn tools. You can use the 20V battery, for instance, but you won’t get as long a run with it before it needs to be charged. Lithium batteries tend to run full speed, and then quit when they’re drained. It is not recommended to leave the batteries on the charger when not in use. Lithium batteries should only be charged as needed and no more. Indicator lights on the charger let you know when the battery is done charging. All GreenWorks tools are made in China. The 20312 is 31 x 9 x 8.5 inches and weighs about 7 lbs without the battery; just over 10 lbs with it. Chain speed is 36 FPS. The owner’s manual specifies a 5/32 round file for sharpening the chain. GreenWorks has an excellent warranty with four years of coverage on the machine, ten on the motor, and two on the battery. This is far and above the industry standard of two years on the machine. The chainsaw, battery, charger, and canvas storage bag. It does not come with bar and chain oil, but the reservoir comes filled. You will need to purchase more, but this saw does not seem to use nearly as much oil as some of its competitors. Everything comes completely assembled. Many reviewers were very impressed with the power of the 20312. Some said it was just as powerful - or almost - as their heavy-duty gas-powered saws. This is saying a lot for a cordless, battery-operated chainsaw. One reviewer said it looked like a toy, but it’s power and features were no joke. The 20312 is great for trees and limbs up to 20” in diameter; many purchasers claimed to have routinely cut this size wood of varying species with no problem at all. Again, the fact that it’s electric and quiet is a huge advantage. There are no noxious fumes and loud noise. It’s light enough to use comfortably, and the battery lasts long enough to get a load of wood cut. Once the battery is drained, it charges quickly. The battery, in fact, is a huge selling point because it’s interchangeable within the G-Max line of cordless outdoor tools. Purchasers who already had one or more of those tools were very pleased with the capability of using the batteries interchangeably. What could be handier? 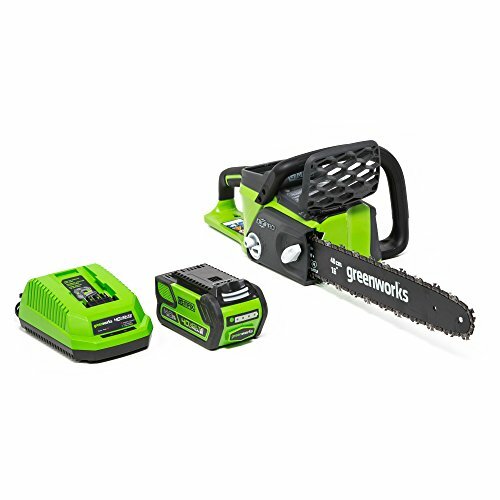 Another great feature of the Greenworks design is that the battery sits in the center of the saw, giving it a balanced feel, in comparison to some other battery-operated chainsaws with the weight of the battery at the back of the saw. That design causes the operator to use a lot more effort to push forward on the saw to compensate for all the weight in the back. This is tiring and makes it much less enjoyable to use. GreenWorks is one of the manufacturers that does monitor its reviews, and reaches out to those who have complaints to resolve the problem. This is a huge trust factor because we all know there are times when something we’ve purchased doesn’t live up to expectations. It’s much easier to buy when you know help will be available if you run into trouble. With a bar length of 16”, the usable cutting length is about 15”. The reason for this is the anti-kickback plates on the tip of the bar. Chainsaws can cut trees with a diameter of twice the length of the bar, but for safety reasons, that would be a task for someone experienced with chainsaws. One purchaser noted in a case where a tree that size (32” diameter) needed to be taken down, the best option would be a gas-powered saw. Any amount of tension on the saw causes the bar to completely stop. One reviewer felt it should not be that sensitive. This causes a lot of stopping and re-arranging the wood you’re working on, and takes up time. Another purchaser noted that problems arose with his saw when a plastic gear failed. The plastic gear meshed with a metal one; unfortunately, that creates too much wear on the plastic side.. He found that to be a design flaw, which over time, could cause repeated issues. Some other purchasers have reported less than satisfactory experiences with customer service, which basically amounted to service reps not being well-trained in the various tools sold by GreenWorks. This became obvious, too, in discussions about technical questions, such as the size of the sharpening file required. One answer to that question came from the GreenWorks Tech, while another purchaser referred to the owner’s manual and submitted a different answer. There was a similar debate about whether or not the 20312 could be used in foreign countries with 220V electric service. According to the battery charger, that is apparently within its specifications. The GreenWorks tech responded negatively, though. The bottom line seems to be using diligence in doing your homework, so you know ahead of time what the capabilities of the chainsaw are; then you can balance that with what you are going to need it for. Overall reviews of this saw are very positive, and although GreenWorks does not have as long a history in the marketplace of power tools as some of the other well-known brands, it appears the company stands behind their product and is working to build a good reputation. So there it is. You’ve got a lot of the most relevant information on the best of the battery-powered chainsaws available. There are some wide variations in power and features from well-known name brands like DeWalt, Makita, and Oregon, to newer and in some ways pretty innovative brands like Greenworks and Scotts. Now you can weigh all the pros and cons and sort through what’s high on your list of priorities for which is the best cordless chainsaw for you. Regardless of which model you choose, you know you’re not going to deal with any of the downsides of a gas powered saw. No fumes, no carburetors, no pull cords, no spark plugs, and mixing gas; greatly reduced noise and vibration, too. While that alone might make this decision a whole lot easier, there is a wide range of features to consider too, as each one has such different benefits to offer. Our goal is to help you get the most out of your purchase. We hope the information offered here will help you to find the best battery powered chainsaw.